We report a 12-year-old girl who developed nephrotic syndrome 6 months after umbilical-cord-blood transplantation (UCBT) for acute lymphoblastic leukemia (L2). In addition to nephrotic syndrome, she also showed autoimmune hemolytic anemia, thrombocytopenia and gastrointestinal symptoms. Since these symptoms were manifested during the course of tapering immunosuppressive agents, a diagnosis of chronic graft-versus-host disease (GVHD) was made. Findings from a kidney biopsy were compatible with minimal-change disease (MCD), and focal glomerular capillary thrombosis and mild tubular damage were also noted. She was treated with methylprednisolone pulse therapy followed by oral prednisolone. Proteinuria disappeared in 14 days. Gastrointestinal symptoms, anemia and thrombocytopenia were also corrected. 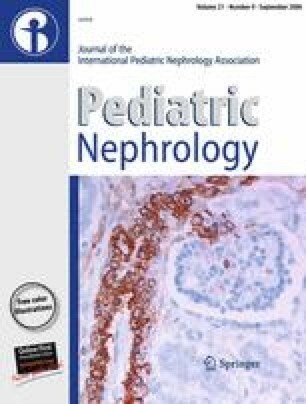 This is a case report of nephrotic syndrome as a manifestation of chronic GVHD developed after stem-cell transplantation. A review of the cases reported in the literature is also made. This case was presented at the 3rd Japan-Korea Pediatric Nephrology Seminar held in Tokyo, Japan, on 28 May 2005.